Whether or not it is something you may have considered before, there is a codification of casino chip colours that are accepted by all casinos. Equally in the case of poker and casino chips for private use there are a number of accepted colours. These come in a choice of blue white and red as well as often black and green. In recent years an even wider range of colours have become available with the advent of cheaper plastic casino chips. Further popular colours these days are grey orange, purple pink, orange and yellow. Certain other recent casino chips have incorporated triple colours in their design through the moulding process. Less traditional colours are often used for either very high values ($500 and above) mostly used in tournaments or otherwise for values in between ($2 or $0.50) which are more often used in low-limit games. Regulations and codification of colours in the USA differ from one state to another. For example between the states of Illinois and New Jersey there are regulations regarding the respect of certain colours. In other cases such as in the State of Nevada there are no regulations and in these cases casinos may use blue white or grey for $1 face value while the higher valued casino chips above $5 are usually always coloured. One regulation in common among all casinos and states however is that casino chips must be identifiable by the spots on the side and indicate the name and place of the casino as well as the casino chip value. Which value chips are used in which games? Mostly in Pai Gow Poker, Pai Gow Tiles and Baccarat the $20 casino chips are used due to the fact that the 5% commission for the banker wagers make for even numbers. Also in casino table games such as Roulette and Craps, $20 casino chips are not unusual. Depending on the casinos and the gambling limits that they allow at their tables and casino games, certain casino chips come in denominations of $1000 and above. 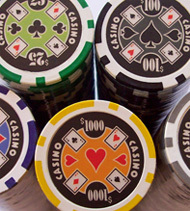 In most cases, these casino chips are either orange or yellow and are usually of a larger size than lower value casino chips. In casinos that cater for extremely high rollers such as in Atlantic City and Nevada casino chips come in values of between $5000 up to $25000 and higher. From one casino to another the colour codification of such high value vary. Casino chips such as $5000 and higher are rarely encountered by members of the general public as they are usually only found in high limit games and VIP rooms for suitably high rollers. In such cases, the casinos often use larger plaques for such high denominations complete with serial numbers. You may be interested to learn that the highest denomination plaque ever used in a casino to date was at the London Club in Las Vegas with a stated value of $10 million! As a matter of comparison, certain casinos in Europe use similar systems. Some popular casino venues use blue casino chips for €10 and pink casino chips for €2 denominations. Similarly to casinos in the US, European casinos also use plaques for high value denominations of €1000 and more. $0.25 Peach Indian casinos may use blue or red, and Florida and Detroit casinos. $0.50 White Variable from state to state. Generally usually red, blue or white. $1 White Not in Nevada. Can also be grey or blue. $5 Red Known as “Nickels”. Usually yellow in California State. $10 Blue Different colour in Nevada casinos. Sometimes brown in California. $20 Yellow Poker Rooms in New Jersey. $25 Green Known as "Quarters". Often purple in California. $100 Black Known as “Cheques”. Often white in California. $10000 Grey AC, New Jersey. Brown colour in Nevada, variable.